Just in time for the holidays, we're teaming up with REACH and Rembrandt to bring our fabulous ABCD Diaries readers the chance to win an AWESOME prize pack full of goodies! -an adorable Snowman Kit-The snowman building kit is a decorative wooden box which includes a black felt hat with blue trim, red felt mittens, red felt scarf, orange wooden carrot-shaped nose, two black wooden eyes, three black wooden buttons, and five wooden buttons for the mouth. Remember to keep your smile looking its best this holiday season with REACH and Rembrandt products which can be found at mass merchandisers nationwide. 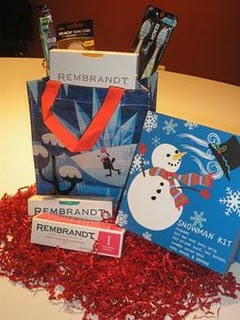 REACH and Rembrandt products also make great stocking stuffers!! Win It: Here's your chance to win all of the goodies pictured above! Disclosure: ABCD Diaries was given a set of the above products for review purposes only. We were in no other way compensated. The opinions expressed in this post are ours and ours alone. Follow you on twitter @FrugalScience! I am already following you via gfc. GFC follower! This would be great! Entered the Life to the Max giveaway! Entered the Gear Tie giveaway! Entered the Cowgirl Chocolates giveaway! Entered the Chicken Soup for the Soul giveaway! Entered the Around The Table Games giveaway! Entered the Bacon Hot Sauce giveaway! follower of your blog, thanks! GFC follower saying this is something we all need and could use. I'm a GFC follower (sksweeps). Thanks for the awesome giveaway! I don't seem to see as many snowmen as I used to. I entered the Stor'em giveaway. I'm a GFC follower. Thanks for hosting! I'm a GFC follower (name: lynn).